I was searching on internet about universe temperature and I found a very interesting study on kind of supernovas called “la supernova”. I will quote some of recent studies findings on this subject and others related to universe and Earth temperature and I will try to link between 4 main studies. The scientific researches on this subject are still new and didn’t solve the mystery behind supernovas behavior yet, and I am sure that the Islamic explanation will be so astonished to the working scientists. Dear Reader, if you find that science part is new for you, please read the summary section at its end before reading the Islamic explanation. [Regardless of the exact details of nuclear burning, it is generally accepted that a substantial fraction of the carbon and oxygen in the white dwarf is burned into heavier elements within a period of only a few seconds, raising the internal temperature to billions of degrees. This energy release from thermonuclear burning (1–2×10^44J) is more than enough to unbind the star; that is, the individual particles making up the white dwarf gain enough kinetic energy that they are all able to fly apart from each other. [The Supernova Cosmology Project is one of two research teams that determined the likelihood of an accelerating universe and therefore a positive Cosmological constant. This discovery was named “Breakthrough of the Year for 1998” by Science Magazine and, along with the High-z Supernova Search Team, the project team won the Gruber Prize in Cosmology in 2007. Their peak brightness seemed to be quite uniform, and theywere bright enough to be seen at extremely large distances. In fact, a supernova can, for a few weeks, be as bright as an entire galaxy. The uniformity of the type “Ia supernovae” became even more striking when their spectra were studied in detail as they brightened and then faded. The detailed uniformity of the type Ia supernovae implies that they must have some common triggering mechanism. We could examine the rich stream of observational data from each individual explosion and match spectral and light-curve fingerprints to recognize those that had the same peak brightness. 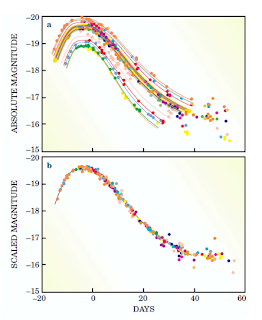 the few type Ia outliers—those with peak brightness significantly different from the norm—could generally be identified and screened out. The anomalously fainter supernovae were typically redder or found in highly inclined spiral galaxies (or both). then the measurement of the changing expansion rate would also determine the curvature of space and tell us about whether the cosmos is finite or infinite. This approach also made it possible to use the Hubble Space Telescope for follow-up light-curve observations, because we could specify in advance the one-square-degree patch of sky in which our wide-field imager would find its catch of supernovae. What’s wrong with faint supernovae? 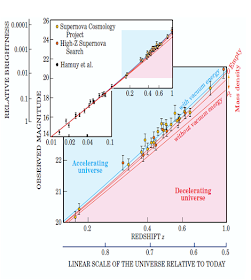 The faintness—or distance—of the high-redshift supernovae in figure 3 was a dramatic surprise. All that mass surely puts a lower limit on how far—that is, to what level of faintness— we must look to find a given red-shift. The high red-shift supernovae in figure 3 are, however, fainter than would be expected even for an empty cosmos. Supernovae from that decelerating epoch should not get as faint with increasing distance as they would if dust or intrinsic evolutionary changes caused the dimming. The dark energy evinced by the accelerating cosmic expansion grants us almost no clues to its identity. The wide-ranging theories of dark energy are often characterized by their equation-of-state parameter w = p/r, the ratio of the dark energy’s pressure to its energy density. Given that the dark-energy density is now about twice the mass density, the only constraint on dark-energy models is that w must, at present, be more negative than –1/2 to make the cosmic expansion accelerate. However, most dark-energy alternatives to a cosmological constant have a w that changes over time. but also the cosmic microwave background, gravitational lensing of galaxies, and other cosmological observations, we have the prospect of taking the next step toward that “Aha!” moment when a new theory makes sense of the current puzzles. 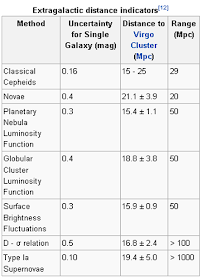 WMAP has detected, with very high significance, temperature shifts induced by hot gas in galaxy clusters. 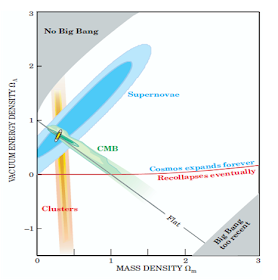 The CMB temperature in the direction of known galaxy clusters is expected to be slightly cooler than the average CMB temperature, due to interactions between CMB photons and the gas in the clusters. This effect has been observed in aggregate by WMAP and is consistent with analogous observations by the South Pole Telescope. Both observations are in conflict with extrapolated X-ray observations of clusters (X-rays probe a smaller volume of cluster gas than the CMB observations) and with numerical simulations, which must be missing some of the complex gas physics in the outer regions of the clusters. 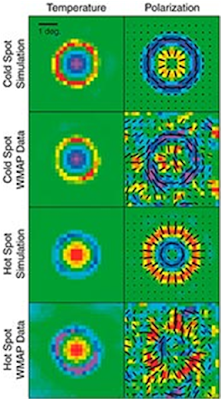 MAP has produced a visual demonstration that the polarization pattern around hot and cold spots follows the pattern expected in the standard model. All this evokes the important question of how sunspots affect the Earth’s climate. To answer this question, we need to know how total solar irradiance received by the Earth is affected by sunspot activity. Intuitively one may assume the that total solar irradiance would decrease as the number of (optically dark) sunspots increased. However direct satellite measurements of irradiance have shown just the opposite to be the case. This means that more sunspots deliver more energy to the atmosphere, so that global temperatures should rise. According to current theory, sunspots occur in pairs as magnetic disturbances in the convective plasma near the Sun’s surface. Magnetic field lines emerge from one sunspot and re-enter at the other spot. Also, there are more sunspots during periods of increased magnetic activity. At that time more highly charged particles are emitted from the solar surface, and the Sun emits more UV and visible radiation. Direct measurements are uncertain, but estimates are that the Sun’s radiant energy varies by up to 0.2% between the extremes of a sunspot cycle.] . Sun spot image . [Cosmic rays are energetic charged subatomic particles, originating from outer space, that impinge on Earth’s atmosphere. They may produce secondary particles that may penetrate to the Earth’s surface, and deeper. The variety of particle energies reflects the wide variety of sources. The origins of these particles range from energetic processes on the Sun (and presumably other stars as well), to as yet unknown events in the farthest reaches of the visible universe. Cosmic rays can have energies of over 10^20 eV, far higher than the 10^12 to 10^13 eV that man-made particle accelerators can produce. The type of “La supernova” has very distinguished and predicable behavior of 2 main types, one hotter than other which can be plotted on 2 light curves. “La supernova” has the brightest luminosity ever recorded (-19.4, +/-0.5) and the farthest range. 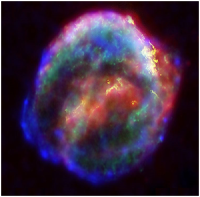 “La supernova” emits huge amount of Dark materials, and ionize shocking waves that can bend stars. The theories behind such explosion are still theoretical models especially that power required for such explosion is not available in one star alone. Sunspots have a cycle of 11 years with ups and downs peaks. There is an evidence of effecting number of sunspots and Earth temperature with universe ionized shock waves. So, if we took wood fire temperature which is between = 1000 – 1200 Kelvin and we multiply 70 x 1000, this means that Hell’s temperature is = 70,000 Kelvin. But, what is the proof? Higher Darker stars temperature, will be > 33,000 K.
And as shown in the below figure of stars temperature, it shows exactly the same order of Hell warming steps as described by the Prophet Muhammad (Sallallahu Alayhi Wasallam): being Red first, then White, then Dark, so the temperature of Hell can really be around 70,000 Kelvin (Kelvin = °C + 273). But what all this has to do with “La Supernovas” and its effect on Universe or Earth temperature? In this Hadith, it shows a relation between Hell’s breath which one is hot and one is cold will be released and it has effect on our climate whether on summer to make it hotter or the winter to make it colder, which could be interrupted as the 2 types of what is called as “La Supernovas”. Hell Fire has 19 of Angel Keepers, and the brightness of “La supernova” which is the maximum measured is -19.4 (+/-0.5) !! That really “La supernovas” are triggered by the same mechanism (which is Hell) and not related to white dwarfs explosions. That their light measurements that show they are from outside our universe (Hell) were correct and not to waste more time in calculating “W” to fit them in our universe dimensions. Since Hell Fire is being created on 7th day, means within 2 billion years period, so its light is newer but farther from our universe (this may help to understand more of its horrible attributes). The effect of ionizing shock waves on Earth temperature and Sunspots numbers. It’s not necessary that such rays are affecting the Sun that may affect the Earth later on, they could be affecting them both on the same time, and this must be verified by researchers later on. Also, this will help to determine exactly the effect of human warming on Earth temperature whether it’s really affecting or not. The injected dark matter inside universe whether it’s cold or hot matter, they are smokes from Hell, and studying such materials will explain us more about how it looks like. 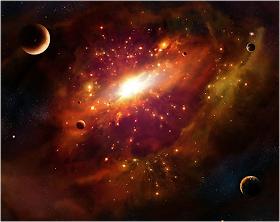 There is no relation between “La supernovas” and universe fate whether it will keep expanding or will shrink back, the answer on this is mentioned in Quran too and will be detailed later on later post of “The End of Story”. The writer was trying to explain these verse, as all people will see the hell fire on the Day of Judgment from far away, then they will see it when passing over it. But according to this post, it may explain the correct meaning of these verses, that God is saying to us that we will see the hell or any of its effect like it’s breath in future, and then on the Day of Judgment, we will see it with certainty of sight, and ALLAH knows better. Twenty evidence of the fact that Atheism is the worst doctrine on earth .. !! 1 – Atheism violates the first law of Newton. The first law of Newton says that “an object at rest will stay at rest and an object in steady motion tends to stay in motion unless acted upon by an external force (static or dynamic).” So there must be an external force that made the Big Bang to happen at that very moment and forced the universe to begin at that very moment. 2 – Atheism violates the first law of thermodynamics. Law of Conservation of energy or what is known as the first law of thermodynamics says ((matter/energy cannot be created nor can it be destroyed.)) If we contemplate in this law, we come to conclusion that the universe cannot exist. According to this law, the universe does not exist or it’s present in the presence of the Creator. 3 – Atheism violates the second law of thermodynamics. The second law of thermodynamic says that the universe is now heading towards thermal death when the temperature of all organisms and particles becomes equal. So the universe as scientists say is heading toward disintegration, towards demolition, towards cooling and towards thermal death “thermal death of universe”, while atheism says that the universe is moving towards complexity and towards building a struggle to develop. So scholars consider the second law of thermodynamics to carry the end of Darwinism and selective evolution. And these are laws, not theories.. so the science on the side while atheism and Darwinism are completely on the other side. 4 – Atheism is contrary to the Code of Ethics. Moral obligation is a restriction of the human being and as Nietzsche said long ago: – The lack of power in human being is because of his ethical commitment. 5 – Atheism does not find an explanation to the law of pairs. The secret of the wisdom of the repeated mentioning of the two sexes, male and female in the Qur’an: “And of everything We have created pairs that you may be mindful” [SURAH ADH-DHARIYAT-49]. “And that He created pairs, the male and the female” [SURAH AN-NAJM 45]. The contemporary philosopher Henri Bergson said that the repeated mentioning of the pairs is not intended for gratitude, but also meant something greater which is to alert that pairing is in plants, animals and even particles and which is a great evidence of the purpose and the denial of the chance, moronic Darwinism, randomness and senselessness. 6 – Material atheism is in contradiction with the immaterial self. If a human being committed a crime and insisted that he did it unconsciously, each lawyer seeks to prove there was no intent, but from the material perspective, the crime took place and ended up on the reality and the offender is also admitting that he’s the perpetrator, but the law interferes to know the purpose, intent and self-condition during the commission of the crime and whether the crime took place unconsciously or not .. Here, we put self in position higher than facts and higher than abstract materialistic reality.. In reality, we do not really judge what happened in the world, but to judge what has occurred within the self .. This reflects the contradiction in principles between man and the world. 7 – Atheism is contrary to the laws of human rights. Human rights is metaphysical pure issue and your saying that human beings are equal this is possible only if the human is a creature of God, so equality between human beings is exclusively ethical, not a natural, materialistic or mental fact, since people from the materialistic, natural or mental perspective are undoubtedly unequal and based only on religion, the weak can claim equality. Those who are weak and poor in money, health and mind and excluded from the tables of the celebrations in the world, those who do not have anything to show or to prove about except through religion only, by which they demonstrate that they are equal to them or even better towards God than the wealthy, and this is where lies the frequent proof of the value of religion in equality. 8 – Atheism violates the privacy of all, since it does not recognize the sanctity and holiness. No value to bunch of virtues that have been established by religions in the last tens of thousands of years. As Dr. Missiri says: – the atheist sees the ground as an exploited matter and his purpose is to achieve maximum satisfaction of it or as the thinker John Locke says: – If all hopes of human is limited to this world and if we enjoy life here in this world, it is not surprising nor illogical to look for happiness, even at the expense of parents and children. 9 – Atheism is contrary to the law of cause and effect. Of nothing comes nothing… there is no effect without a cause .. this common sense is erected in the mind because it is higher than the law and on it stands the modern science and goals’ purpose. 10 – Atheism contradicts the law of intent and care. 11 – Atheism is contrary to teleology. Science is in constant progress … all scientists’ researches based on the existence of laws governing the world and controlling the matter .. the purpose of science in every search is to find the law governing this case since the science is teleological and therefore it is in constant progress .. and without the science adoption already of a law that governs all things for this progress, the science would not progress one step .. and here lies the contradiction in principle between messy atheism and teleological science.. and it is not imaginable that everything around us is governed by the law of teleology and the human is the only being responsible in this case. 12 – Atheism contradicts the law of consistency previous to consolidation. 13 – Atheism violates the principle of the famous Barclay. 14 – Atheism is the founder of most criminal doctrines on the Earth. Se Gore says: – The Darwinism doctrine is one of the despicable doctrines that are not supported except by the worst tendencies and contemptible feelings, since its father is infidelity and its mother is dirtiness. Nazism was formed only on the discrimination of races and ethnicitiy. Mao Zedong the atheist thug said: – All the lower animals will be executed and all who stood against the revolution is an evolutionary error, and said in a December 9, 1958 “mass graves provide a good fertilizer for the land.” As a result, 50 million people was killed in China. As a result, 250 million people was killed in one century by horrible Darwinian atheism and this is probably more dead people, more than all the wars from Adam (alayhis salaam) to this day. 15 – Atheism is against art and life. The existence of another world along with the natural world is the primary source of every religion and art .. and If there was only one world, the art would be impossible. Atheism will never understand the essence of art and nature .. If there is no spirit of man so why we are keen to have the spirit of art? When the science deals with the man, it looks at it as what is dead and what is not personal, while when an art deals with man, it looks at what is humane and teleological, since art is on a natural collision with the world and with all its sciences, that the silent rebellion and if there is absolutely no support to man with no room for his spirit and his self, then the art is not an area for him and the poets and tragedy writers deludes us and write nonsense that does not make sense. Art in nature and its recognizing of the existence of another world is carrying revolutionary meanings of blasphemy of materialistic world… and that was understood by the famous French painter de Buffet when he said: – “the essence of art is uncomfortable and useless, it’s against society and the threat of it.” Therefore, the essence of works of art are fully and vaguely obscure, it’s a continuous rebellion on the reality. It is repeated confession of the existence of another world that we do not belong to and we will go to it one day .. confession of human suffering on the ground and its inability to achieve the paradise that lies within his dreams and to search for it .. Art is simply is the fruit of the relationship between the spirit and the truth. So when you contemplate on deep painting.. When you read a great novel .. the human being feels a strange sense that is mysterious with transcendence and holiness and entering the world of eternity .. Art is exactly as religion, both are recognizing the existence of another world, but art is not a religion but an expression of religion. Art is the illegitimate son of the truth… while religion is the legitimate son of the truth ..
16 – Atheism represents abnormality in the history of civilization. And The author of the book why we say that God exists says:- “and there one who said that man is guided to God with revelation or without revelation, but with the revelation, it was better and thorough, and some argued that all the worships are revelation from God, but it might be an old revelation that was stained with myths from magicians and fortune-tellers, so the primitive nations sidetracked in their ignorance and God was sending Messengers to purify these beliefs from sidetracking.” And Schmidt and Lang – two of the researchers of the assets of religions – say that the origin of all religions in purpose is the Oneness and the diversity came in the later stages, and it have been discovered that inheritance of Indian American and Indigenous residents of the North America are similar in many decrees to monotheistic religions particularly in terms of punishment and reward and here where lies the argument on people, where they are equal in reason and requesting guidance .. and humans differ in religion, but they agree in what God wants them to do. Sheikh Nadeem Aljssr said in his book, the story of Faith, p. 35: – It’s more likely that many philosophy of the ancients in Egypt, China and India are the remnants of forgotten history, so the owners of these philosophies were stacked among the philosophers and they might have come from prophets or prophets’ subordinates. That’s why atheism is abnormal approach that appears in temporary image and quickly disappears and if it‘s beneficial to people, it would’ve stayed on the earth. 17 – Big Bang and the fall of the myth of the stable static universe. In 1989, NASA had launched the satellite (Cuba) for the detection of cosmic radiation resulted from the Big Bang and compiling information on the radiation and this satellite was able in only 8 minutes just to give a complete picture of the radiation and it is proven that the universe is made and this is what knocked off the atheists in critical embarrassment. And DENNIS SCIAMA said that he did not defended the steady-state theory, not because he deemed it valid, but because he wished that it were valid. SCIAMA goes on to say that as evidences began to pile up, he had to admit that the game was over and that the steady-state theory had to be dismissed.. And that he must leave aside the theory of the stable universe and his colleague GEORGE ABEL said that he has no choice but to accept the Big Bang theory. “Notoriously, confession is good for the soul. I will therefore begin by confessing that the atheist has to be embarrassed by the contemporary cosmological consensus.” .. because the science has proven the idea that were defended by religious books. 18 – What is the mystery behind the bias of modern science towards the Qur’an? Gustave Le Bon says “Islam is religion of the most appropriate for scientific discovery”, and that’s the reason of the frequent convert to Islam in the scientific community of doctors, researchers and professors. The wonderful Alija Izetbegovic Say: – Aristotle has wrote three scientific books (in physics in the heavens .. .. in the earth) These three books do not exist today with one sentence that is scientifically valid .. three books from a scientific perspective is equal to zero to ten, while the Qur’an as Maurice Bucaille says in his famous book (the Qur’an, Bible and the Torah in the perspective of modern science): – The truth is I did not find any verse from the Qur’an that is contrary to one scientific fact but the Qur’an already passed the modern science and corrected many of the scientific theories that were prevalent in his day, for example the idea that groundwater was formed through a deep gorge at the bottom of the continents moved underground water from the oceans to the depths of the earth did the Qur’an ratify this scientific myth which was prevalent in that times or said. “Do you not see that Allah sends down water from the cloud, then makes it go along in the earth in springs” [Surah Zumar 21] ….. The source of groundwater is made up of springs, rain and not from Aristotle gap in the depth of the continent …….. And so on. 19 – Atheism does not give an explanation for anything. Atheism is not a solution but a confession of a failure in finding a solution and this is the beginning of atheism and the end of it .. The Quranic Chapter 18: “The Cave” (Al-Kahf) was revealed to answer a few questions which the mushriks (unbelievers) of Makkah, had put to the Prophet Mohammad (sallallahu alayhi wasallam) in order to test him..
One of the questions was: Who were “the Sleepers of the Cave”? The disbelievers of Makkah were told that the story of the Sleepers of the Cave was a clear proof of the creed of the Hereafter, as it shows that Allah has the power to resurrect anyone He wills even after a long sleep of death as He did with the Sleepers of the Cave (they slept over 300 years). THE HIDDEN MEDICAL REFERENCES WHEN THERE WAS NO MEDICAL SCIENCE LIKE TODAY!! The other bodily functions were veiled, and the eye did not see though open. And their muscles did not move, although they were alive. Their shape did not change although many years elapsed as they did not notice real changes on their faces when they woke up. Their conditions as such are like that of preserving organs through cooling to cause metabolic inhibition, which is used extensively in the medical field to preserve donated organs (heart, kidneys, cornea, etc) before transplantation into another body. Therefore, the sun inclines towards the right when rising up and towards the left when setting down, so that it will not strike them, while they are in a gap in the cave. So, coolness in this gap in the Cave away from the heat of the sun that did not touch them, was sufficient to inhibit bodily metabolism for the preservation of their bodies all this long period. Had they been only asleep, they would have needed water and food to survive, and would have been awaken by the need to urinate after some hours. But Allah inhibited all their biological functions and preserved their bodies in a living shape. As Allah preserved their eyes through blinking, He also preserved their bodies from ulcers through constant turning so that they would not be affected with pressure sores. Question: It is now known that eclipse is nothing but a normal process that occurs after a regular interval (that can be known) of the moon coming between the sun & the earth. Then why was it that Holy Prophet ﷺ used to pray at that time, though it didn’t cause any danger!? When the sun was eclipsed at the time of the Messenger of Allah ﷺ, he ﷺ commanded someone to call out “al-salaatu jaami’ah (prayer is about to begin)”, and he led the people in prayer. Then he addressed them and explained to them the reason for the eclipse, and declared their jaahili beliefs to be null and void. He explained to them what they should do, such as praying and making du’aa’ and giving in charity. He (peace and blessings of Allah be upon him) said: “The sun and the moon are two of the signs of Allaah; they do not become eclipsed for the death or life of anyone. If you see that then call upon Allah and magnify Him, and pray, and give in charity.” The Muslims did not know when an eclipse would happen, but when it did happen, they would hasten to do what Allah had prescribed, such as praying etc. When an eclipse happened, they would be afraid that is was a warning of impending disaster, so they would turn to Allah and pray to Him to ward off that which they feared. When astronomy and the calculations of the movements of the sun and moon became well known in later times, and it became known that the experts could know when an eclipse was likely to happen, the scholars (‘ulama’) pointed out that this did not change the ruling, and that the Muslims still had to do what they were commanded to do at the time of an eclipse, even if they knew about it in advance. But it is not prescribed to concern ourselves with the matter of predicting eclipses, because that is not what Allah and His Messenger ﷺ commanded us to do. The scholars also explained that an eclipse may be a sign or a cause of something bad happening to people. When the questioner says that eclipses do not cause hrm, she is speaking without knowledge and objecting to the sharee’ah of Allaah. People do not necessarily know of the events which Allah causes to happen at the time of an eclipse, and some people may know about that whilst others do not. It could be that because of the Muslims’ prayers, Allah wards off bad things which are known only to Him. The Muslim must submit to the ruling of Allaah and act in accordance with His shari’ah, and have faith in His wisdom, because He is the All-Knowing, All-Wise, may He be glorified and exalted. Solar and lunar eclipses are two of the signs of Allah with which He scares His slaves and reminds them of some of the things which will happen on the Day of Resurrection, when the sun will be wound round and will lose its light and be overthrown and the stars will fall (cf. Surah al-Takweer 81:1), and the sight will be dazed, the moon will be eclipsed and the sun and moon will be joined together (by going into one another, or folded up, or deprived of their light) (see. Surah al-Qiyaamah 75:8-9). This is why Muslims should be alarmed by eclipses. The Prophet (peace and blessings of Allaah be upon him) used to fear Allah very much, and one day he came out in an agitated state, thinking that the Hour had begun, when the sun was eclipsed during his lifetime… This is indicative of the great extent to which he kept the Hour in mind and feared it. We, on the other hand, have become negligent and most people no longer think of eclipses as anything other than a natural phenomenon which they go out to watch with special glasses, carrying cameras. They limit themselves to the worldly scientific explanation without understanding the reminder of the Hereafter which it brings. This is one of the signs of hard-heartedness and a lack of concern about the matters of the Hereafter. It reflects a lack of fear of the onset of the Hour, and ignorance of the aims of sharee’ah and the reports that the Prophet (peace and blessings of Allaah be upon him) used to feel fear when these eclipses happened. The Sahaabah (may Allaah be pleased with them) used to stand to pray the eclipse prayer, because they believed that if indeed the Hour had come, they would not then be counted negligent of their prayer, and if this eclipse was nothing to do with the Hour, then they would not lose anything by praying, for they would have earned a great reward. We ask Allah to make us among those who fear Him and who are afraid of the Hour. May Allaah bless our Prophet Muhammad ﷺ. How do we understand the Hadith of the sun’s prostration beneath the Throne? The opponents claim that this saying of the Prophet (ﷺ) proves that the sun is what moves and sets, then it hides from the whole earth, and that the sun prostrates beneath the Throne, and waits for permission to come back again to rise which means that it stops moving at a point when it goes beneath the Throne which contradicts what has been proven by modern science that the sun is still and rotates on its own self. If you follow the writings of the opponents, you will find that they jump with joy on this; a lot of them mention it and don’t get bored by repeating it continuously, and they find it as one of the strongest statements against Islam. Many scholars have spoken of it and tried to explain it and clarify its meanings to address the doubts surrounding it. They were not blind to this Hadith and it was a very interesting topic for them. The Hadith mentions that the sun sets while facts are contrary to it; the sun neither sets nor moves to any place and the earth’s rotation causes the sunset. This contradiction is not correct since the Hadith only mentions the sunset without mentioning the cause; it is the same as the verses mentioned earlier which speak of what the people see. The Hadith mentions that the sun prostrates beneath the Throne which implies that the sun stops moving and this contradicts modern science. Before commenting on this matter, we have to clarify that the mentioned prostrating is a special prostrating and is not the absolute physical movement to Allah (ﷻ); thus the Hadith states a special prostration related only to the sun. Moreover, saying that the prostration implies a stop is inaccurate. Since the base of the claim is faulty, that the sun prostrates like humans do, the argument itself is faulty as well. The fact is that the sun’s prostration and asking for permission is unknown to us. We do not know about it nor how it happens. Read a specially dedicated piece on this argument here. The same is true for the prostration of the trees and stones and their glorification of Allah (ﷻ); if they are close to us and around us yet we do not know the manner in which they prostrate, then how can we understand the sun’s prostration? Allah (ﷻ) says about their prostration: [The seven heavens and the earth and whatever is in them exalt Him. And there is not a thing except that it exalts [Allah] by His praise, but you do not understand their [way of] exalting. Indeed, He is ever Forbearing and Forgiving] [Qur’an 17:44]. If the manner of the sun’s prostration is unknown to us, we cannot claim that it contradicts science as applied science does not recognize unknowns and only deals with what is applicable to the experiment. If science hasn’t experimented on a case, we cannot negate that case by saying that since science does not know yet, it does not exist and if it does not exist now, it has never existed. Such logic would be rejected by science and to do the same with Islam would be incorrect. It is clear that the opponents of the sun’s prostration claiming it to be against science don’t have clear evidence to prove it a contradiction, and they have said it themselves that if it is unknown to science, it does not exist. Moreover, prostration of the sun does not contradict the human mind because proving the opposite of something is invalid except if we know it for a fact and understand its nature. The sun’s prostration is unknown to us and we don’t know its manner, then how can we judge it and say that it contradicts our mind?! We do not deny that what the Hadith states is unfamiliar to the human mind; however, there is a big difference between what the mind does not understand and what the mind cannot comprehend. Sometimes what the prophets inform people are topics which the mind does not understand but they do not tell the people about that which is impossible and that which the mind cannot comprehend. The opponents confuse between these two matters; sometimes they say that if it is unknown to the mind, it is impossible after which, for them, Islam contradicts science and mind. Therefore, if the sun’s prostration is an unknown thing, it is not correct to contradict it and say that it implies that sun stops because it is not correct to state something’s specifications except if we already know its facts. And it returns and emerges out from its rising place and it glides (in such a normal way) that the people do not discern anything. This means that nobody understands its prostration or seeking permission. Thus they do not discern anything. Somebody may argue that the Hadith says that the sun is still until it is said to it: Rise up and return to the place whence you came. They may argue that this implies that the sun has to stop moving. We answer that it is not like that; it means that it is still under prostration until permission from Allah (ﷻ) to rise again is received, thus the permission is related to the prostration and not the motion. We have already said that the prostration does not imply motion except if it was a familiar prostration to the humans; however, this is about the sun and we don’t know how its prostration looks like. The Hadith mentions that the sun goes under the Throne and prostrates there but the fact is that the sun does not change its path or its orbit, then how can it go and come back?! This style is known in the Arabic language; we say, for the one who went to pray, that he went to meet his God but the meaning here is not that he went above the heavens to meet Allah (ﷻ) there. It is correct to say: the man has gone to the desert to meet the moon and to lie down below it; the meaning is not that he is going to the moon in its orbit to meet it there. The Hadith has specified the time of prostration, which is at the sunset, and mentioned that it does not prostrate at the time of sunrise; it is known that the sunrise and sunset are rational matters, since the sun is already rising and setting at the same time in different places, then it would be impossible to think that the sun prostrates and not prostrates all the time and having a single sunset at some moment on the whole earth contradicts applied science. The sun’s prostration is unknown as we have already mentioned and we cannot specify the criteria of/for unknown things. Thus, saying that it is mandatory that the sun prostrates all the time is based on our wrong understanding of the prostration, which is unknown to us. For this, we find a similar matter elsewhere in Islamic texts and that is coming down of Allah (ﷻ) every night to the first sky in the last third of the night. Some have criticized this coming down claiming that there is always a last third at some point of the earth and hence this would mean that Allah (ﷻ) would be coming down all the time, every time. This alleged contradiction is based on an incorrect idea that Allah (ﷻ)’s coming down is the same as the humans which is totally false. The same thing is with the sun, we do not know how the prostration looks like and hence, we cannot relate it to our understanding of the human prostration. It might be correct that the sun has some point in its orbit where it will be typically adjacent to the Throne and this point is at the time of the sunset on the Arabian Peninsula where the Prophet (ﷺ) spoke the Hadith. This would mean that the Hadith does not state that the sun, at the time of sunset, prostrates beneath the Throne, neither does it say that the sun prostrates every time the sun sets. Accordingly, the Hadith does not mention that the prostration takes place only at the time of sunset. The Prophet (ﷺ) did not say that (the sun was setting beneath the Throne) but he was speaking to those present at that time and at that time, the sun had set and prostrated and asked for permission from Allah (ﷻ). Therefore, this would mean that the Hadith is related to that point and that specific time. This is not denying that it is adjacent to the Throne while it orbits [A’lam al-Hadith fi sharh sahih al-Bukhari, al-Khattabi (1894/3)]. These opinions imply that the scholars did not understand that the sun prostrates when it has some sort of partial setting; thus, it does not prostrate all the time but just once when it is adjacent the Throne and that is when it sets from the Arabian Peninsula. According to this, many of the opponents are now in trouble because they did not understand the actual meaning of the sayings and built a faulty understanding and wrong consequences and mixed up between the unknown and the impossible matters.